In regards to performance and penmanship, Rosa delivers beautifully with “Portrait”. His album shines with poignant and compelling compositions that move from one to another with a thematic quality that gives the recording a logical contour from start to finish. The album has an undeniable “New York vibe” in terms of compositional style and aesthetic choice with brooding harmonic textures and dense rhythmic interplay. 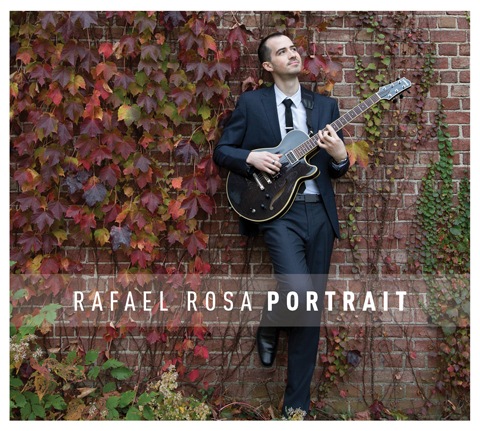 In terms of tone and style, Rosa’s guitar playing is very much in the vein of Kurt Rosenwinkel, Mike Moreno and other modern jazz guitarists of similar nature. His stirring chordal intro to “Portrait of a Woman” and soaring solo on “Bomba Oscura” are worthy examples of this. However, what sets him apart from the flock is his ability to blend this particular brand of guitar playing into stylistic environments few of his contemporaries would dare pursue. He possesses a level of familiarity and comfort with jazz, Puerto Rican Folkloric, Afro-Cuban and other styles to the point were his compositions are melded in a cohesive manner that sounds natural, genuine and never arbitrary. It is this broader stylistic pallet that allows him to paint on a larger canvas, therefore showcasing modern jazz guitar in a different light. Although the guitar remains in the forefront for most of the recording, Rosa is by no means a “greedy” bandleader and features all musicians involved in an almost autonomous manner. As a result both the core musicians and special guest contribute generously with formidable solos and expansive ensemble work. Maverick bassist John Benitez is rare specimen by any musician’s standard and demonstrates this fact in full force on “Portrait”. His innate ability to organically blend into any musical setting is something that truly makes him special. Mere words simply cannot describe the relentless swing and huge sound that Benitez injects into every note he plays on the first four tracks of this album. His acoustic bass is recorded beautifully and at times you feel as though you were standing right next to him as he plays. Drummer Joel Mateo is another standout musician on the album. His dancing 7/4 groove on “Devotion” shimmers with a light yet unwavering quality, almost as if the soloist were walking on a sheet of glass. Another prime example is “Portrait Wandering Magic” in which he carefully weaves a tapestry of undulating dynamic variation agreeably apt to the songs title. Indeed all musicians involved shine on “Portrait”. In ways both and distinctive and dissimilar, piano guests Kenny Werner and Jean-Michel Pilc make rousing contributions to “Portrait Wandering Magic” and “Pensando En Agua”. Their work on the record is a thought-provoking study in contrast to how the piano can be interpreted in a relatively similar setting. Furthermore, despite the fact that “Portrait” features a fairly generous roster of visitants from track to track, one cannot ignore that some of the albums most musical moments come from none other than Rosa’s core lineup. Certainly, his principal quintet is a formidable ensemble that is both comfortable and fearless with Rafael’s compositions, pushing the music forward with noteworthy voices of their own. In all, “Portrait” is a convincing and robust debut by any standard and incorporates all the traits that embody the genetic makeup of New York jazz. Throughout the album Rosa proves himself to be a triple-threat, filling the roles of composer, instrumentalist and bandleader with a sense of matured facility. His music contains an abundant mixture of sentiment and imagination with healthy amount of audacity thrown in for good measure. Undoubtedly “Portrait” is a worthy listen for enthusiasts of jazz and Latin-jazz alike.